In “The Founder’s Paradox,” on view last month in Auckland, Thiel’s philosophies stand in contrast to the ideologies of Max Harris, a young Oxford-based Kiwi who has argued that New Zealand is undergoing the erosion of communal values. The antidote, he argues, is a new “politics of love.” It seems no accident that on entering the gallery, you ascend to a level of the gallery where reimaginings of cooperative games like Jenga and Twister explore Harris’ work, and then descend into a dank, cold basement to tour the world of Thiel. Thiel—PayPal co-founder, Facebook investor, Trump supporter, immortality-seeker and, it should be mentioned, funder of the lawsuit that bankrupted Gizmodo’s former parent company, Gawker Media—is a figure more myth than man. “The Founder’s Paradox” is an unpacking of Thiel’s own self-made mythologies, and their hazards. 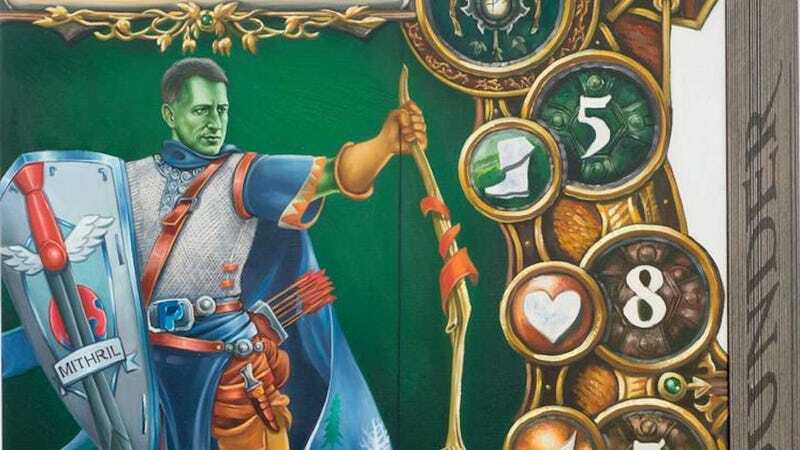 In the most direct skewering of Thiel’s ideologies, Denny casts Thiel as a green-faced “contrarian hero” with anti-aging powers and a PayPal belt buckle battling monsters including the democracy and public activism in a recasting of the role-playing game Descent. In another, Thiel wields a glowing orb in a game that reimagines Settlers of Catan as “Founders,” a quest to leave behind Earth’s decaying lands for man-made seasteads, the moon, and Mars. Other nods to Thiel’s work are more subtle. In the Game of Life: Collective or Individual, players have “made it to Stanford” and must make choices between studying the humanities or technology and getting paid in crypto or fiat currency. Players collect literature cards for books including Atlas Shrugged and The Sovereign Individual, works often cited by Thiel. “I am happy to say categorically that I have found no other country that aligns more with my view of the future than New Zealand,” Thiel wrote in his citizenship application. At one point, Thiel invested $3 million in Xero, a New Zealand accounting firm, according to the company, and $4 million into a company called Pacific Fibr that hoped to build a trans-Pacific cable. But New Zealand is a nation with socialized healthcare where those who seek success too aggressively are often derided as “tall poppies” — many have viewed his presence in the country as an uncomfortable fit.